Apache Kylin is a OALP Engine that speeding up query by Cube precomputation. The Cube is multi-dimensional dataset which contain precomputed all measures in all dimension combination. Before v2.0, Kylin uses MapReduce to build Cubes. In order to get better performance, Kylin 2.0 introduced the Spark Cubing. 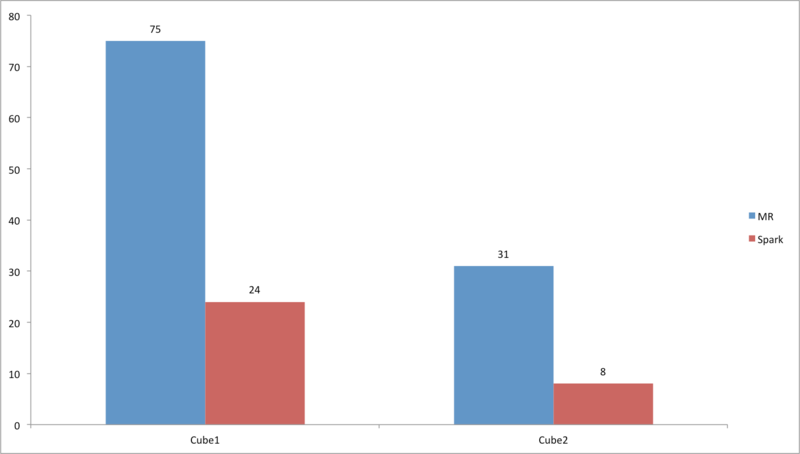 About the principle of Spark Cubing, please refer to this official blog：By-layer Spark Cubing. In currently Spark Cubing(beta) version, it doesn't support HBase cluster using Kerberos bacause Spark Cubing need to get matadata from HBase. To solve this problem, we have two solutions: ony way is to make Spark could connect HBase using Kerberos, another way is to avoid Spark connect HBase in Spark Cubing. As for How to make Spark connect HBase using Kerberos in Yarn cluster mode, please refer to SPARK-6918,SPARK-12279,HBASE-17040. The solution maybe could work, but not elegant. So I try the sencond solution. The core idea is uploading the necessary metadata job related to HDFS and using HDFSResourceStore manage the metadata. Before introducing how I use HDFSResourceStore instead of HBaseResourceStore in Spark Cubing. Let’s see what's Kylin metadata format and how kylin manage the metadata. Every concrete metadata for table, cube, model and project is a JSON file in Kylin . The whole metadata is organized by file directory. The picture below is the root directory for Kylin metadata, This picture shows the content of project dir, the "learn_kylin" and "kylin_test" are both project name. Currently, only HBaseResourceStore could use in prod env. FileResourceStore mainly used for test. HDFSResourceStore still has some concurrent issue, but which could be used for read safely. Kylin use the "kylin.metadata.url" config to decide which kind of ResourceStore will be used. Now, Let’s see How I use HDFSResourceStore instead of HBaseResourceStore in Spark Cubing. Update the kylin.metadata.url and then write all Kylin config to "kylin.properties" file in local metadata dir. Construct the HDFSResourceStore from the HDFS "kylin.properties" file in Spark executor. Of course, We need to delete the HDFS metadata dir. These are the Spark configuration I used for Spark Cubing. The goal is to make our user set less spark config. For the source data level is from million to hundreds of millions of，my test result is consistent with the By-layer Spark Cubing basically. The performance improvement is Remarkable. Moreover I tested with billions of source data or having huge dict specially. In a word, Spark cubing is much faster than MR cubing in most scenes. When we have enough memory resource，Spark Cubing could use more memory resource to exchange more better build performance. Spark Cubing isn't stable enough currently. There is more cube build level. There is lesser source data. As we all known, A big difference for MR and Spark is the task for MR is running in progress and the task for Spark is running in thread. So, in MR Cubing, the dict of Cube only laod once, but in Spark Cubing, the dict will load many times in one executor, which will result in GC frequently in Spark Cubing. Spark Cubing is a great feature for Kylin 2.0, Thanks Kylin community. I will popularize Spark Cubing in our company. I believe Spark Cubing will be more robust and efficient.